The Ordinary Life of an Extraordinary Girl: Do you have the right information? I am so grateful for all the friends I have met through Down syndrome and was reminded of this on WDSD. Sometimes I just feel like yelling Down syndrome is AWESOME from the rooftops, and most of the time I do. So when people and even medical "professionals" talk about prenatal testing and aborting fetuses with Down syndrome I get nauseous. Read this and get Mardra's essay today - for free. Is this the last generation of people with Down syndrome? Roughly 24 years ago the universe looked over my resume, took into account my previous experience, my qualifications, and my goals and gave me a job that I was totally – I mean utterly – unqualified for. Parent. And as an added bonus and complete surprise, the universe also immediately promoted me, as a show of good faith, to the role of special needs parent. The application process was cleverly disguised, I won’t bore you with those details but the final result was a new lifelong job with very few personal days, occasional opportunities for “working” vacations, and joyful benefits beyond what I ever expected. From the Outside, it didn’t look good. 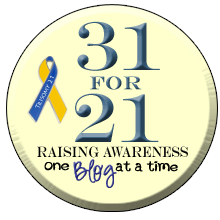 I can tell you over the last few years I’ve put a lot of thought into this question and answer because of the new T21 prenatal testing that gives a diagnosis of Down syndrome and other trisomies at about 10 weeks via a blood test. What does this mean for the future? I mean even within the next 20 years? 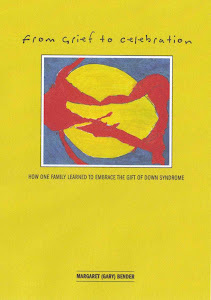 Down syndrome and eugenics, is this the last generation? Quite possibly, a few years ago it was reported that Denmark, for example, is on track to be “Down syndrome free” by 2030. When I read this I felt like I had been kicked in the stomach. For the record, this is not a pro-choice/pro-life argument. I’m talking to a very specific group of people – Women who want a child and the healthcare providers who serve them. Also I am not opposed to genetic testing. I’m opposed to the one-sided conversation that so often follows. 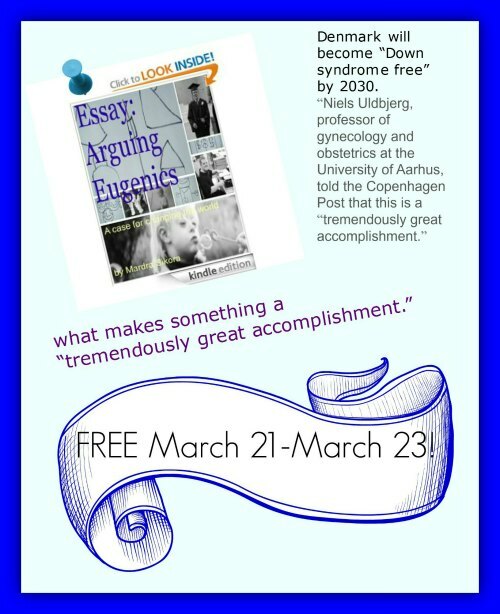 When I read the quote that Denmark will be Down syndrome free, I spent weeks venting on paper and compiling notes, research and quotes, and then released the essay “Arguing Eugenics: a case for changing the world” on Kindle. It is for sale at $1.25, however – from March 21 to March 23 it is FREE.